This past winter in southern New England was, according to the weather folks, colder than usual. I verified this information by checking my heating bills for the past few years. As March approached, I anticipated more moderate temperatures that signal spring was just around the corner. However, as April came to a close and there was still snow on the ground in many of my frequent haunts, I started to wonder if we were entering a new Ice Age. The soil in my garden was still frozen in spots, and most of the spring garden shops were still closed. It wasn’t until the second week of May that the weather started to develop a spring warming pattern. I checked with the weather folks in Massachusetts, Connecticut, New Hampshire and Rhode Island, and they assured me that what seemed to be a colder-than-usual spring, was in fact normal for this part of the world. After listening to me complain for about 20 minutes, my daughter Sarah sighed, gave me a hug, and informed me that I may be getting a little softer as I age. Ouch! To comfort myself, I started looking for anything that would indicate spring was close and summer not far behind. 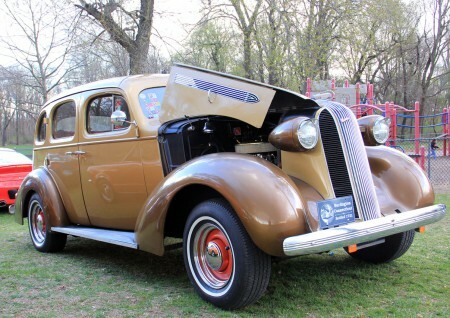 Early spring in New England, regardless of the weather, is car show season. I have been attending these in all of the New England shows for about 50 years. Drooling over cars that I can’t afford, fly fishing, and photography are my three good habits. 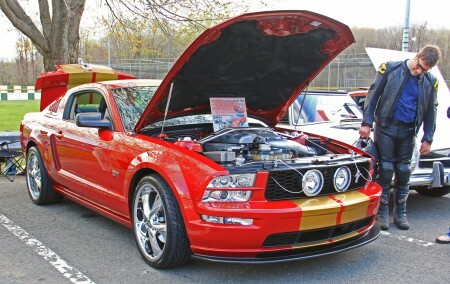 In the Farmington Valley, car shows start in late April and continue through the fall. I usually attend at least 3 or 4 every year. 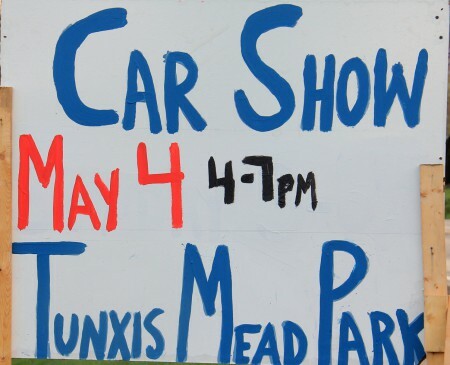 This year the show at Tunxis would be my first. 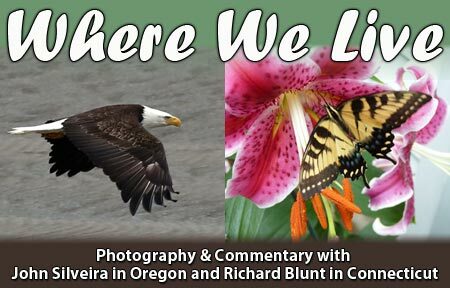 Since the early 1990s, I have been attending these shows with two objectives in mind: the first one is simple — I enjoy viewing the craftsmanship, attention to detail, and classic art work that is always on display. Secondly, I am hoping to once again see a car that I first saw parked on a side street in Cape Cod’s Provincetown. After only one encounter this car became my secret passion. Unfortunately, it was not one of the show cars, but I included it anyway. Just for fun, I have included a music video of the show. When I grow up, I want one of these macho, muscle machines. If Darth Vader drove a car, this is what you would find parked in his garage. 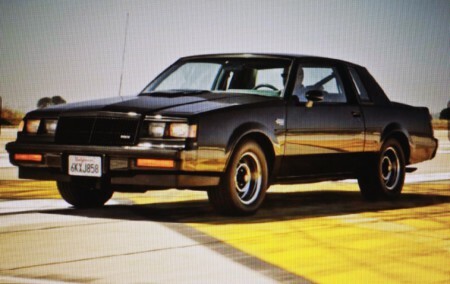 This limited edition road commander was released by General Motors in 1987. They only manufactured about 500 units, which sold for about 30 grand each. Most of those sold to celebrity collectors like Burt Reynolds, Reggie Jackson and Sylvester Stallone. I have been told that one of them, in mint condition, sits in a California Buick dealership show room. Like other muscle cars of this era, this car was meant to go fast and be driven hard. Even by today’s standards, this car has some impressive specs. This sinister looking black coup, with it’s sneering grill displays enough macho and muscle to make a growling Jaguar wine like a house cat. Other muscle cars may be faster, but few have the commanding looks of this tough guy. If you ever see one of these powerhouses, beware. 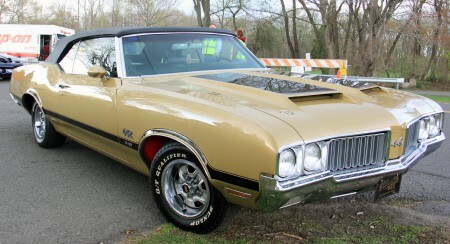 Despite its looks, it is not an Olds Cutlass or a Chevy Monte Carlo. Before attending a local auto show, I usually stop by my favorite used car dealership to see if they will have a car on display at the show. This shop conditions and sells only high-end cars like Jaguar, Mercedes and BMW, and once in while I see one of their cars on display at tha show. 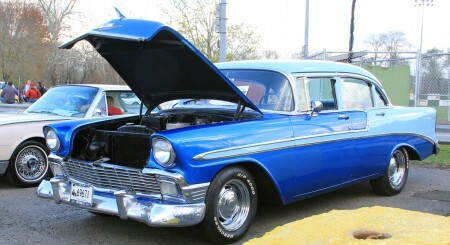 I was surprised to find a completely restored 1957 Chevrolet Bel Air sitting in a prime location on the lot. A long-time friend of mine — Bobby G— owned an exact duplicate of this car in the early 60s. 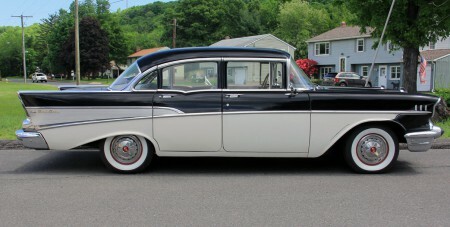 I believe the only difference between this car and the one that Bobby dove is: the lower front and rear quarter panels and the lower doors were painted black on Bobby’s Bel Air He always kept this car super clean and shiny. There were times when saw him standing next to this beauty, and I couldn’t tell which was better looking Bobby or the car. If you see Bobby, tell him that he can buy this beauty for a negotiable price of 21,500. 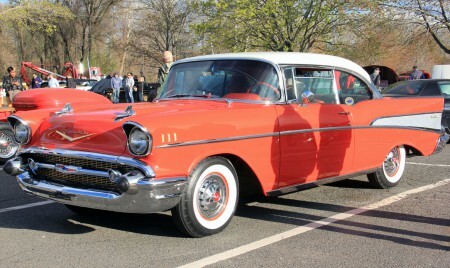 Another restored 57 Bel Air on display at the car show. This, I believe, is a Prohibition-era Cadillac. The suicide doors in the rear give it a real Mob car look. 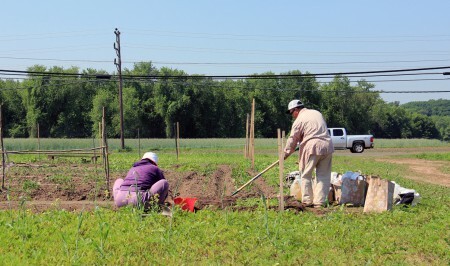 For me and millions of other want-to-be farmers, spring is also time to plant our gardens. The daytime temperatures in my area are averaging in the low to mid-60s, but falling to the low 40s at night. Since all of my seedlings are starting to outgrow their inside home, I decided to harden them off in the cold frame and move them to their permanent homes in in the garden and hope for the best. I got lucky and despite overnight temperatures in the 40s all of the seedlings did well. The only problem I had was direct seeding green beans in soil that was below 60°. The seeds revolted and refused to sprout, so I had to plant them again. 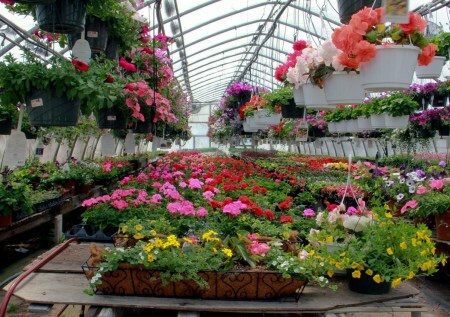 Teaching myself how to get worthwhile production from only 50 square feet of planting space took a couple of years of research and practice. This small space now provides enough of 9 selected vegetables and herbs for my family throughout the growing season with enough extra to donate to a local food pantry. This year I have planted: (from the foreground), three varieties of beets, three varieties of carrots, thyme, oregano (both of these are perennials), four varieties of tomato, eggplant, Kentucky Pole beans and cucumbers. 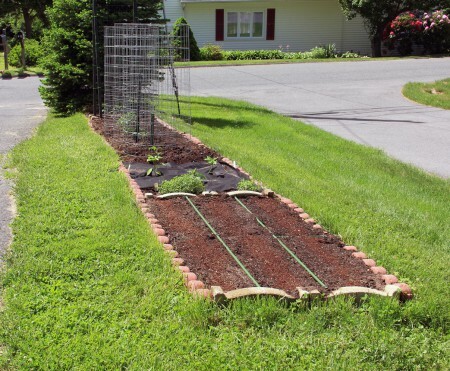 In past years, I have successfully planted kale, parsnips, sweet corn, lettuce cabbage, potatoes and onions. 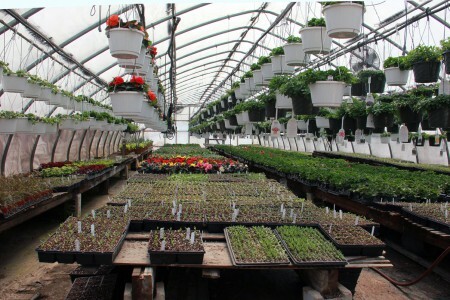 A visit to the Krell Farm greenhouses confirmed, for me, that planting season was here at last. 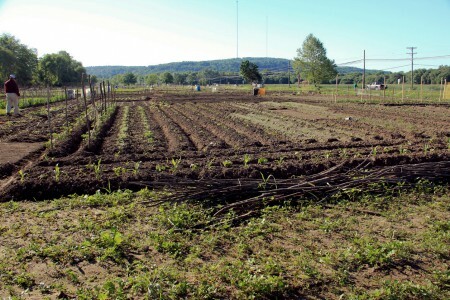 Despite a late and chilly beginning, the Kolp garden plots are doing well.